Merry Christmas Eve, everyone! 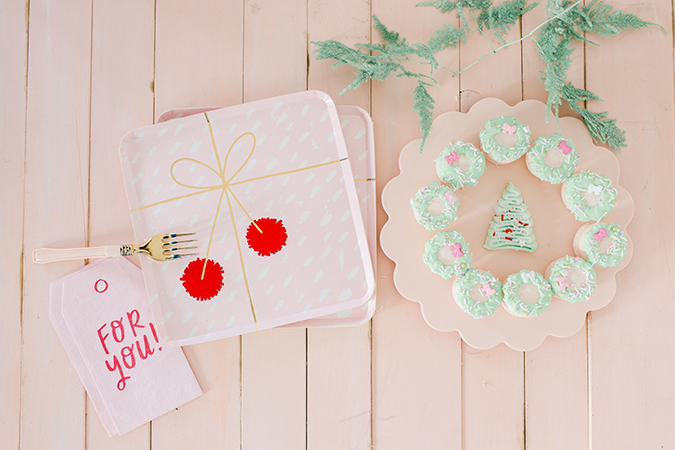 Whether you’re somewhere snowy or enjoying the warm Southern California winter like we are, there’s nothing better than baking the day away. 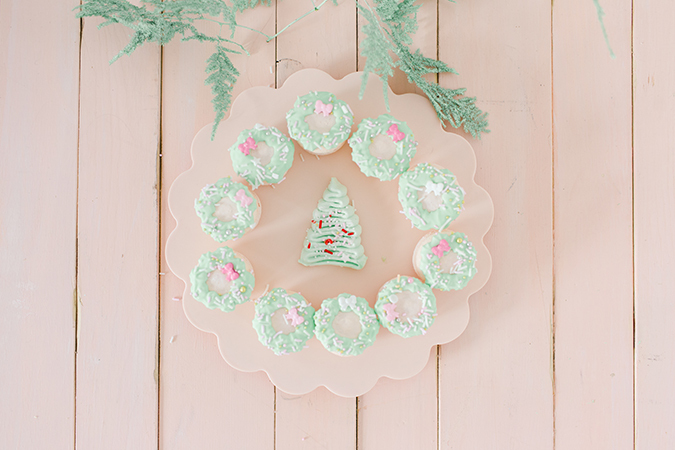 Our lovely friend and baker extraordinaire Lauren Lowstan whipped up these adorable Christmas wreath macarons to make your morning just a little bit sweeter, and we can’t get over how pretty they look on a cake stand for a festive brunch. If you’re dying to see how to recreate these beauties for yourself, read on for Lauren’s step-by-step instructions…. 1. Measure out all of your ingredients before you do anything else. Since macarons are all about doing things at the right time, you want everything set up and ready for each step. 2. Line a baking sheet with parchment paper. Get a large piping bag ready by cutting the tip off and adding a small piping tip in at the bottom. 4. Sift the mixture through a fine mesh strainer into a large bowl and set aside. If there are any large clumps left over, leave those pieces out. 5. Add your eggs to a mixing bowl fitted with a whisk attachment, and start whisking on medium. After about 15 seconds (once the eggs are frothy) add in all of the granulated sugar. Keep mixing on high speed until you have stiff peaks. (You know you have stiff peaks when you take your whisk out of your mixture, and the peak of egg whites does not move at all). 6. Add in your food coloring to get a light pink. Mix until stiff and glossy. 7. Scoop out the beaten egg white and add it into the bowl with the ground almond flour and powdered sugar. 8. With a rubber spatula, carefully blend everything together, using a folding motion. Work your way from the bottom of the bowl and slide your way up the sides, folding the batter back onto itself. 9. When the batter is evenly mixed, it will look shiny and creamy. You know you’ve mixed enough when you scoop some batter up with your spatula, and it slowly drips off your spatula. 10. 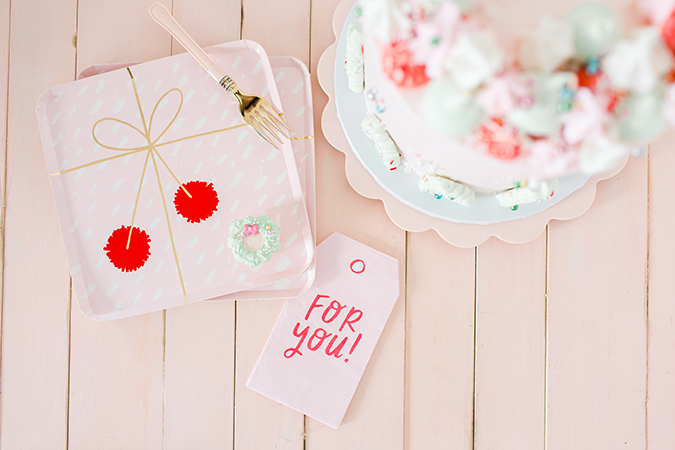 Now it’s time to add your batter to a piping bag. You need to hold the tip of the pastry bag with one hand to guide it, and hold the larger end with the other hand to push the batter down. Place the tip very close to the parchment paper, holding the bag upright, and pipe out to 1 to 1.5-inch discs. When you’ve hit the desired size, just lift the piping bag up and stop putting pressure on the bag. This can be tricky, so you might need to practice the pressure and piping out to get the desired size. 11. Once you’ve piped all of your discs onto your tray, tap your baking sheet on your work surface about 5 times. This takes all of the air bubbles out. 12. Set your baking sheet aside and let your macarons dry out. The time depends on the humidity in the room. It usually ranges from 15 to 30 minutes. You’ll know they’re done when you lightly touch the tops with your finger and they will be completely dry—not sticky at all. 13. Halfway through the drying time, preheat your oven to 275 degrees. Once your macarons are dry, bake for 10 minutes. They’re done baking when you touch the tops of them and the bottoms don’t move. 14. Let the macarons cool completely and pop them in the freezer for 10 minutes. This makes them easy to slide off the parchment paper. 15. Take an offset spatula and slide it under each macaron. This slips them off the parchment right away. 16. I like to match the macarons up so each half fits together. Fill each one with buttercream and sandwich them together. 1. In a bowl of a stand mixer, whisk the meringue powder and water until frothy. 2. Add in all the powdered sugar and beat with a paddle attachment until thick and fluffy, for a couple minutes. Tip: Don’t skimp on this step! The longer you beat it, the fluffier it will become. Add in a tiny bit of mint food coloring. I like to dip a toothpick into the coloring and then add it to the icing. Once thick and fluffy, add to a piping bag fitted with a small star piping tip (or any other small tip). 3. Working with one macaron at a time, pipe little dots around the top of the border. 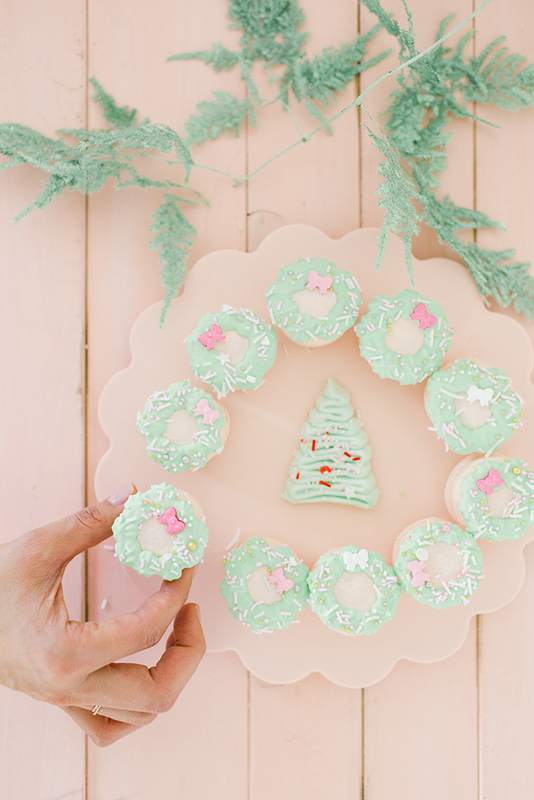 Add a candy bow to the top middle and then sprinkle the rest of the wreath with sprinkles. Continue until all macarons are done. 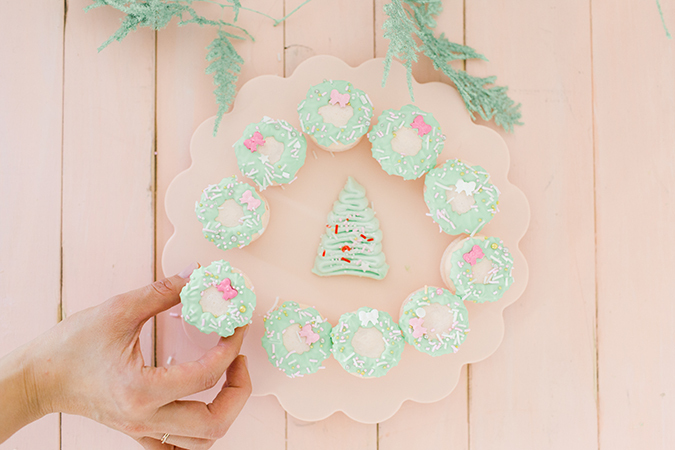 Are you going to whip up these cute and festive sweets? Tell us how they turn out below!